So far in this chorus of 12 bar blues, we've been harmonizing a walking bass line with simple, mostly parallel harmonies. In this lesson, I wanted to shake things up a bit. 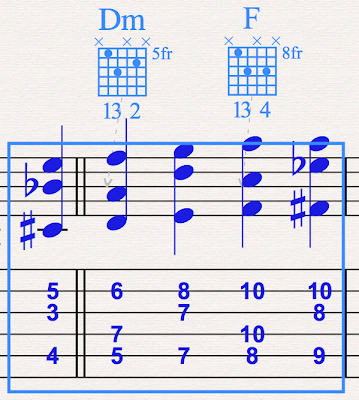 The last beat of bar 8, and all of bar 9 of the blues form are highlighted in the picture below, because I wanted to draw your attention to two things. First, please note that I've changed bar 8 a bit from the version in Freddie Green IV. The last chord has a Bb instead of the B Natural in the last example. Second, the middle voice in measure 9 sings a different type of song than we've so far explored. It's moving in a way that we haven't moved it yet. It moves independently of the outside voices. In Measure nine, the middle voice hops back and forth between the 4th and 3rd strings. This is an often overlooked and undervalued maneuver in Freddie Green style playing. Creative players take note: you could expand on that technique in many ways. This concludes the 12th measure of a 12 bar blues, and leaves you on beat 1 of the next twelve bars, but with a different 'grip' than we started with in lesson III. The form begins again, but with some different grips, and a new bassline, perhaps. The next task is for you to make up your own bass line, and harmonize it in creative ways using the grips and ideas we've so far explored.